Ans: B Dipicolinic acid is exclusively found in bacterial spores. And: A line from medial canthers to angle of mandible divides maxilla, used for staging of Ca maxillary sinus. Ans: B Lubiprostone is a gut selective chloride channel opener used exclusively in the management of idiopathic constipation. Ans A in a case of ovarian tumor abdominal examaiton reveals the cystic swelling felt separated from gravid uterus. In later month of pregnancy confusion may arise. The pt is examined vaginally in head down trendelenburg position to elicit the groove between the two swelling i.e. gravid uterus and the ovarian tumor (hingorani sign). 8. Blount’s disease is a cause of? Ans: D it is a typical disorder affecting the postero-medial epiphysis of proximal tibia (due to avascular necrosis) thereby leading to over growth of the lateral epiphysis resulting in agene / tibia vara deformity. It is common in West Indies & Africans. Ans: B the incidence of pneumothorax may be as high as 1 to 6% when brachial plexus is blocked through supraclavicular route but fortunately most of these pneumothorax resolve by themselves without t/t. 10. Which is true about LAD-2 disease? The right common iliac vein ascends almost vertically to the inferior vena cava, while the left common iliac vein takes a more transverse course. For this reason, the left common iliac vein may be compressed between the right common iliac artery and lumbosacral spine, a condition known as May-Thurner (Cockett) syndrome resulting in decreased venous return in left leg. Kasabach Merritt syndrome: Consists of haemangioma or haemangio-endothelioma or angiosarcoma with consumptive thrombocytopaenia with resulting purpura. Nutcracker syndrome is the compression of the left renal vein between the superior mesenteric artery and aorta. This can lead to renal venous hypertension, resulting in rupture of thin-walled veins into the collecting system. All of the above are causes of unmanaged Flail chest but it is pendulufft (movement of air from one lung to another due to paradoxical movement of chest wall resulting in decreased exchange of gases) which results in most deaths in case of flail chest. Left or Anterior Vagus = Anterior surface ® br. to Liver & GB & continue as Anterior Nerve of Latarget which supply acid & pepsin secreting area of stomach & end as ‘Crow’s feet’ to supply pyloric antrum. 16. Which of the following represents compound myopic astigmatism..? Ans: B Both sphere and cylinder are with- ve sign in compound myopic astigmatism. Ans: A also seen – pin cushion effect, roving ring scotoma. Ans: A the renal biopsy in poststreptococcal glomerulonephritis demonstrates hypercellularity of mesangial and endothelial cells, glomerular infiltrates of polymorphonuclear leukocytes, granular subendothelial immune deposits of IgG, IgM, C3, C4, and C5-9, and subepithelial deposits (which appear as “humps”). Immunofluorescence staining gives “starry sky” representing deposition of IgG & C3. Ans : D Hashimoto’s encephalopathy has been defined as a steroid-responsive syndrome associated with TPO antibodies, myoclonus, and slow-wave activity on electroencephalography, but the relationship with thyroid autoimmunity or hypothyroidism is not established. The hoarse voice and occasionally clumsy speech of hypothyroidism reflect fluid accumulation in the vocal cords and tongue. 20. Vagal nerve stimulation is used in the treatment of which of the following? Ans: C VNS is an emerging method of treatment of depression. It is offered thorugh the cervical portion of the left vagus which is stimulated in a pulsatile manner (like a pace maker). Preliminary studies showing promising results. The VNS received the FDA approval for the treatment of resistant depression since the year 2005, July. Ref: Kaplan, charles B, J Neuropsychopharmacology (2006), 31, 1345-1355. Dr Shivya did her MBBS from Lady Hardinge medical college and joined DAMS in her 6th semester in foundation and followed it up with test and discussion course in internship with DAMS Delhi, enrolment number- 0298/09, 1009/06. She secured Rank 1 in PGI Chandigarh and Rank 24th in AIIMS 2009. DAMS: Congratulations on securing a top rank in AIPGE 2009. What is the secret of your success in this exam? Dr Shivya: I think secret to cracking any exam is hard work and perseverance. Dr Shivya: My parents supported me throughout the year. They were always there when I went through my low moods and always encouraged me to do well. Dr Shivya: I have grown up in a family of Doctors.I guess medicine was ingrained in me from the very beginning !!! Dr Shivya: Every single time!!! Each and every moment in the last year was spent in doubts. But somewhere knew that my hard work will pay off!!! But I had never assigned, that it would in such a nice way. Lipincott – Biochem. DAMS books on AIIMS were especially helpful. Dr Shivya: Amit Ashish and Mudit Khanna were helpful, Soumya Sukhla for Radio/Derma/Psychiatry was not as yielding as I thought it would be. Many answers were wrong. Triple A for various subjects (but after reading text). Dr Shivya: DAMS was an integral part. It kept me on schedule with the regular tests. New topics discussed in classes were very helpful. Many prospective questions were asked in the exam. The teachers always helped me and answered all my innumerable questions. Probably DAMS is the only institute which has the ability to predict questions. Dr Shivya: My style was always selective intensive study. I revised what I had read rather than read new things every time. Dr Shivya: Preparing for multiple PG exams is difficult as the pattern of every exam is different. But I think one should give all exams. As questions in every exams are different. Dr Shivya: First year subjects – Anatomy/Physics/B.C along with Pathology, Pharmacology & short subjects. Dr Shivya: In PGI – I attempted around 245/250 questions. Dr Shivya: Radiology, in PGI Chandiogarh, as PGI is one of the best institutes in India and Radiology is an upcoming and interesting branch. Dr Shivya : Dr. Sumer Sethi (Radiology) is always a big influence and his style of teaching is too good. Dr Rajiv for ENT was very good. Teachers for medicine was very good. Dr.Ruchi Rai, Dr. Deep were good teachers. In fact, I don’t remember any teacher at DAMS who was not upto the mark. Personal attention is one of the most important thing because of which I would rush for DAMS. PG Medical Entrance exams have seen emergence of DAMS (Delhi Academy of Medical Sciences) as the leader in the MD/MS coaching business. This year PG medical entrance exams have seen emergence of DAMS (Delhi Academy of Medical Sciences) as the leader in the MD/MS coaching business. Never before has any coaching institute registered such a high percentage of selection. 90% of the students registered with DAMS in 2009 have a rank in PG medical entrance exams. In some state PG exams like Delhi PG, Rajasthan PG, Maharashtra PG there have been a huge percentage of DAMSONIANS getting through for yet another year. Delhi Academy of Medical Sciences (DAMS), one of the best PG Medical Entrance Coaching Institute gets Rank 1 in Delhi PG Entrance Examination and Rajasthan PG 2010. Earlier PGI Rank 1 for December 2010, a two year student of DAMS said in an interview given to DAMS personnel that DAMS contributed significantly in her success. DAMS shares its joy with all the student of DAMS who has done the institution proud by topping this year’s PG Entrance Examination. DAMS are delighted that this years PG Medical Entrance Examination result. Speaking on this proud moment, Dr. Sumer Sethi, Director, Delhi Academy of Medical Sciences (DAMS), said, “We very cordially congratulate all students for this unprecedented achievement and this will be remembered in the annals of our outstanding record. Delhi Academy of Medical Sciences (DAMS) a well-established name in the field of PG Medical Entrance Education for over 11 years now. Today under the leadership of Dr Sumer Sethi, Radiologist and pervious topper in AIPG/ AIIMS . DAMS is recognized for its impeccable foresight, enviable expertise and innate acumen. For more details you can visit DAMS website http://www.damsdelhi.com. 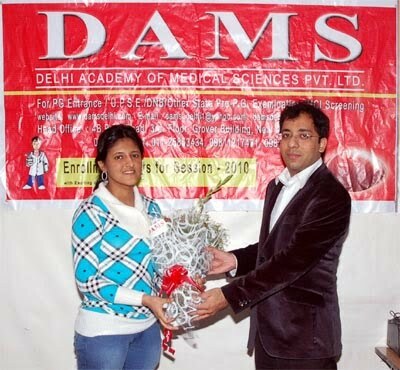 DAMS (Delhi Academy of Medical Sciences Pvt Ltd) has been an institution of excellence for PG entrance preparation for more than 10 years now. We have produced toppers in exam after exam every year. While our competitors apparently claim to be the best without actually delivering the quality material and faculty required for PG entrance DAMS has silently but steadily emerged the leader in the business. Not only do we provide the study material and classes, our counsellors take special efforts in motivating the students to achieve to their potential’s best. We are the only institute authorized by authorities like leading medical colleges SMS Jaipur and SN Medical college Jodhpur to take classes for their students in their college premises for last 3 years now. Currently we have class room coaching Delhi, Maharashtra (Mumbai, Nagpur, Pune), Gujarat (Ahmedabad & Baroda), MP (Indore & Bhopal), Rajasthan (Jaipur & Jodhpur), Andhra Pradesh (Hyderabad*, New Centre), Punjab (Chandigarh) and UP (Lucknow) and test centres across the country. We run our monthly AIPG pattern test called as All India Grand Test on 3rd Sunday of each month along with our exclusive Bounce Back series which is a rapid revision of the previous years’ questions. We are the only institute which frames new questions for our grand tests and provide references to the answers along with an exclusive point by point explanations. Also we receive all email queries and regarding the grand test questions and produce an errata if necessary in the next GT. We are originators of the concept of Test and Discussion Series in Delhi and boast of faculty par excellence. Probably we are the only institute which can actually lead an average student to success. We take pride in our percentage results which are the highest in this business, every year 90% of the students enrolled with us get through PG entrance, which is exceptional. DAMSONIANS have been the leaders in medical fraternity always. We have taken an AIIMS guide every year for last five years now and students look forward to our publications, because they are accurate and fast. This is the usually first book which hits the market and yet the most accurate, in terms of questions and authentic duly referenced and discussed answers. Further we encourage the students to discuss their doubts on this book on our website www.damsdelhi.com , through emails and through Elsevier Exam zone. Our institute is lead by Dr Sumer Sethi, MD who has been a topper in previous AIIMS, AIPG (AI RANK 4) and PGI entrance exams and was a topper in CBSE PMT before. He is MD Radiology and is author leading book for PG entrance called as Review of Radiology, Peepee Publishers. With his guidance institute provides the student a unique advantage wherein not only is he taught his subjects with DAMS but we provide him with success mantra by people who have done it before. On the contrary most of the other institutes are run by businessmen or people who have never actually gotten through PG entrance and don’t actually understand the way to success. We have teachers and question writers who are MD or DM or M.Ch in their respective fields, who are leaders in their respective branches, are popular authors of PG entrance books, toppers in previous exams and now have been exclusively teaching with us for years now. We hope that this book once again proves upto your expectations and helps you to climb the ladder to success. This book is compilation and effort of all the DAMS faculty without their efforts and inputs this book couldn’t be possible. Our faculty have been widely acknowledged and renowned as the subject wise authorities’ country wise. Ans: A this is a new drug approved for the treatment of advanced HIV in combination with other anti-HIV durgs.